XenDesktop 7 would fail to create new Machine Catalog whenever it fails to create a Snapshot of the chosen VM for Master Image. In my case, Snapshot creation was failing as my vCenter server was failing to Connect to the ESXi host due to expiry of license. New-HypVMSnapshot : The create snapshot operation failed. 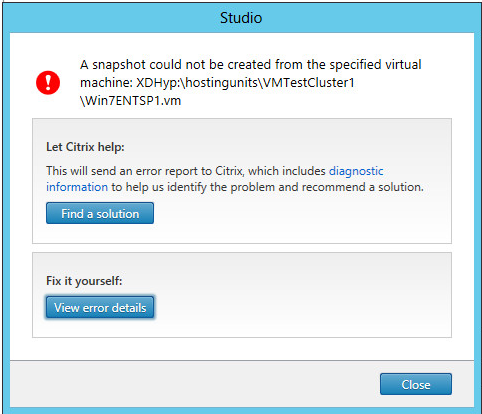 Citrix.Console.Models.Exceptions.ScriptException The create snapshot operation failed. Sdk Error Message : The create snapshot operation failed.